I take exception to the quote, “Life is a journey, not a destination.” My suggested change is: life is a journey AND a destination. While I agree that we never completely arrive, it also seems that along the journey, we do seek out and hopefully enjoy destinations. For example, a long prepared performance, competition, graduation, or celebration is a destination along the journey. There can also be rest stops. These are the places to pause and think about the direction we are going. For Dr. Bloom, his journey into acting has led to what he calls subtle changes. Once again, I must take exception; this time to the word “subtle.” Since Dr. Bloom’s injury six years ago, he has had a family member or caregiver, besides his wife, help him steer his power wheelchair up the ramp into his van and then this person would drive Dr. Bloom’s wheelchair into the e-z lock and the whole process would reverse upon arrival. Well, not too long ago, Dr. Bloom’s daughter, Bonnie, was attempting to help him with the wheelchair into the van process, and it was not going so great. In response to this Dr. Bloom stated “it was a bummer for her.” So, he said, “Let me do it!” Well, he did! Dr. Bloom drove the wheelchair up the ramp, turned it around, and glided it into the e-z lock position. He also did the reverse process. Subtle? No, this is huge! Now, Dr. Bloom and his wife can go out alone! No caregiver, no other family member needs to be there to help. Dr. Bloom said, “Now I can go to Target and pick out the cereal I like!” He and his wife can go on dates! Dr. Bloom’s independence has advanced. So, yes, it is about the journey. It’s also about the destinations along the way! 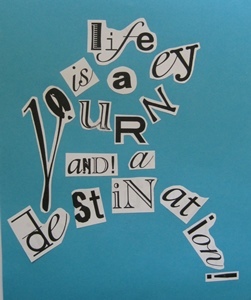 What are some of the destinations you have enjoyed in your life journey? Elizabeth Vander Kamp began teaching fitness classes in 1999, after earning a White Belt in Nia, a mind-body-spirit fusion movement technique. She now holds a Nia Brown Belt, is certified through the American Council on Exercise, the Arthritis Foundation, and is on the master teacher tract of Ai Chi (T’ai Chi in water). Before journeying into the world of fitness, Elizabeth worked as a professional actress. She wrote, performed, and toured the U.S., offering over 400 shows, of a one woman play about the world’s greatest athlete, Babe Didrikson Zaharias. In 2003, Elizabeth returned to her hometown of Birmingham, Alabama, with her husband, and soon thereafter they had 2 daughters. She works at Lakeshore Foundation and it was here that she met Dr. Bloom. Elizabeth’s passion for people, art, and movement have united in the work she and Dr. Bloom do together. She thinks it’s pretty funny that one of her greatest acting defects - overacting - has become one of her most useful teaching tools. Not doubt, there are many destinations on our journey of life. I can’t get enough destinations. I hope to have more.